Set up an appointment to be evaluated and learn critical information about "Black Hair Loss" that will help you to be able to understand the diagnosis and treatment options to help save your hair. Are you a hair stylist noticing a trend toward more and more hair loss among your female clients? Maybe you’re a black woman suffering from hair loss yourself? This can be a frustrating and even devastating condition. 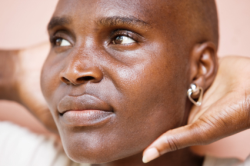 There is a silent epidemic of hair loss and permanent baldness that has been going on for at least 25 or 30 years and it primarily affects African American females. I have set a goal to create and improve the connection and communication process between the medical professional community and the cosmetology professional community to effectively address the existence, cause, progression, treatment, and prevention of this problem. Dermatologists who treat African American patients on a regular basis are readily aware of this problem. The most severe form of hair loss leads to scarring and permanent baldness which is known as Cicatricial alopecia. The Cicatricial Alopecia Research Foundation (C.A.R.F. @ www.carfintl.com ) was founded to support research and find a cure for this condition. BlackHairMedicalExpert.com is a website developed by Seymour M. Weaver, III, M.D., a board certified dermatologist to help create and disseminate medical information about issues related to Black hair care and provide a process by which hair care professionals and medical professionals and consumers can unite to improve hair health in the Black community and minimize the destructiveness and discomfort caused by hair and scalp diseases. There is an expression that “Knowledge is Power”, so BlackHairMedicalExpert.com operates from the premise that the more the community and professionals know about hair and scalp disorders, the greater the power will be to minimize the pain, suffering, and discomfort that these conditions cause.